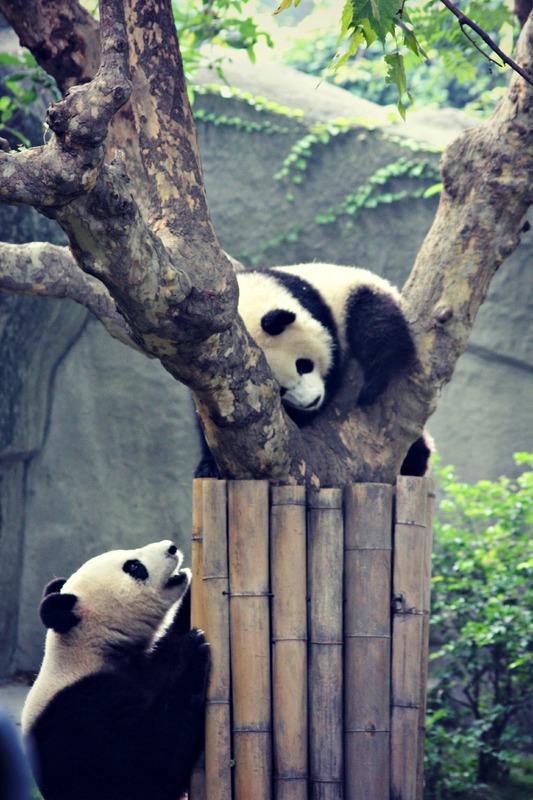 Chengdu – Park Life, Dating, Hot Pots and Pandas. Head straight to the ‘People Park’ in Chengdu, it’s hilarious and fascinating. It’s a city centre park and as soon as you head in there’s music playing in every direction. It’s just a typical Thursday afternoon, no public holiday, but the park is packed, mainly with the older generation. Walk one way and there’s a show taking place with two heavily painted elder ladies doing a performance which I can only describe as burlesque meets ballroom. A huge crowd had gathered to cheer on the ladies and I watched transfixed with morbid fascination. Turn a corner, through the tree lined path and I stumbled upon a group of locals doing something similar to line dancing mixed with aerobics to trashy Chinese pop. They welcomed people joining in and a few of our guys did. Gangnam Style came on and everyone went mental. The locals know all the moves, with new people joining in all the time. It reminds me of learning dance routines to do a show to your family. Not that my bros and I ever did that – honest. All throughout the park you’ll stumble across games of badminton and randoms doing karaoke with the full kit, just standing there solo belting out some power ballads. Being old in China looks much more fun than in the UK. Venture in a little deeper and there’s a hundreds of bamboo posts with signs written up in Chinese. We found one written in English and worked out what was going on. Parents were posting ads to find their children suitable partners. An old school dating site, with elderly people frantically making ads and noting down phone numbers for potential dates for their kids. When I say kids I mean for their 20/30 something offspring. Can you imagine that happening back home?! Head into this area with caution as you will get prompted to post your advert up! Everyone’s spotted Chinese people out and about with Umbrellas/parasols on hot sunny days. Their purpose is to keep their skin from getting tanned, but also help protect you from the intense heat. Umbrella hats aren’t something to be ridiculed here, they actually start to make sense. Chengdu is famed for its hotpots. These sound simple enough but they involve a pot in the middle of your table with stock, chills and veg and they gradually add more ingredients: Pork and prawn dumplings, pork balls, potato, fish, tofu, Pak Choi etc. It gradually heats up to boiling, cooking the ingredients in front of you. You scoop out what you want to eat and dip it in your bowl of sesame oil, garlic and coriander. It’s pretty messy but tastes good. Just in case you don’t think it’s tasty enough we got a handy pot of MSG on our table! Apparently you just add it to your food like you would with salt or pepper. The city is beautiful, full of brightly lit skyscrapers but full of open space too. We got horrendously lost and walked for 2 hours which always helps you get a real sense of where you are. Then just outside Chengdu you can visit Giant Pandas and Red Pandas at a research centre. We got there early so we could watch them munch on their bamboo breakfasts before the heat got too much for them. This centre had newborn baby pandas which I’m sure must be a good sign but I was a little sad to see they sleep in comparatively small glass rooms and only get let out at 8.15am. When they do get out they’re free to roam fairly large park like areas. ← Xi’an – Terracotta Warriors, Cycling and sunshine.